We’d heard from a few people who’d been to India that you either love it or hate it, but you never go back. Both are strong opinions so we couldn’t decide and felt more in the middle of loving and hating our visit. Instead we’re sharing the things we loved about India and the things we hated so you can read through them and decide for yourself. Despite getting sick from the “hygienic food” our New Delhi neighbor made us, we in fact loved the food. Our host encouraged us to eat with our fingers, said a lot of locals do and that it’s “very hygienic”. I kept my arguments to myself and tried it, super messy but fun to be encouraged to play with my food! Our favorite meals included: cheese mughlai, dal fry, aloo gobi, aloo matar, dum aloo, kashmiri rice, dal tadka and of course the naan! Eating Indian food for almost every meal for 8 days straight did cause our stomachs some upset, and it can be spicy. We like a little spicy, but the food we thought was pretty spicy didn’t even compare to the level of spiciness that locals would eat… insane! 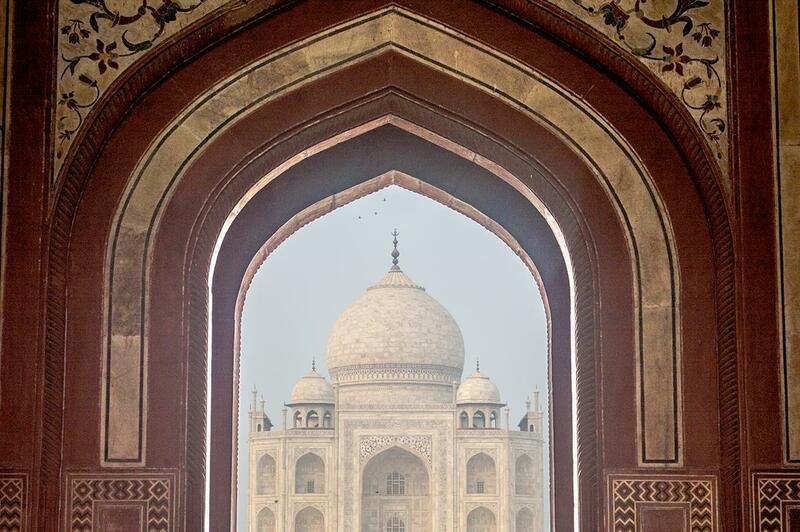 The big reason that brought us to India in the first place was of course the Taj Mahal. Our hotel in Agra was just down the street from the Taj Mahal and we could see the entrance from our rooftop. It was nice standing on the rooftop witnessing the chaos below instead of being a part of it. With the monkeys hanging out on the rooftops with us I kept thinking how this was a scene straight out of Aladdin. It was surreal to finally walk up to the Taj Mahal and mentally check it off the bucket list. It was foggy everyday we were there and the fog was thickest in the morning so we waited until the afternoon to see the Taj Mahal. Those that went in the morning were rewarded with not being able to see the Taj Mahal until they were a few yards from it. The Taj Mahal had amazing detail and beautiful carvings. Inside of the Taj Mahal were 2 tombs- one for the architect and the other for his wife. Besides the tombs there’s nothing else, it was solely built for them. A lot of people find the inside disappointing, but why not just call it romantic and take it for what it is… amazing. It was hard to see anything in India besides crowds of people, animals and vehicles, but we still spotted some of Agra’s old architecture in the door frames and houses as we walked through the winding back roads. 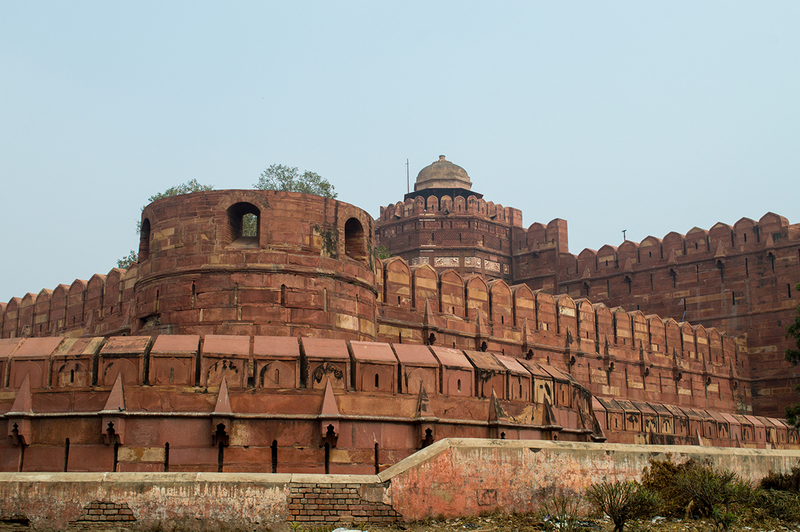 In addition to visiting the Taj Mahal we also paid a visit to the large Agra Fort, Itmad Ud Daula and Jahangir Mahal in Agra. The architecture on these structures were beautiful and unique to what we’re used to seeing in Europe and the U.S. In New Delhi we visited the Jama Masjid, Gurudwara Bangla Sahib, Red Fort, Lodi Gardens (great spot to get some peace and tranquility) and India Gate, all of which were good to see but not as cool as the spots in Agra. 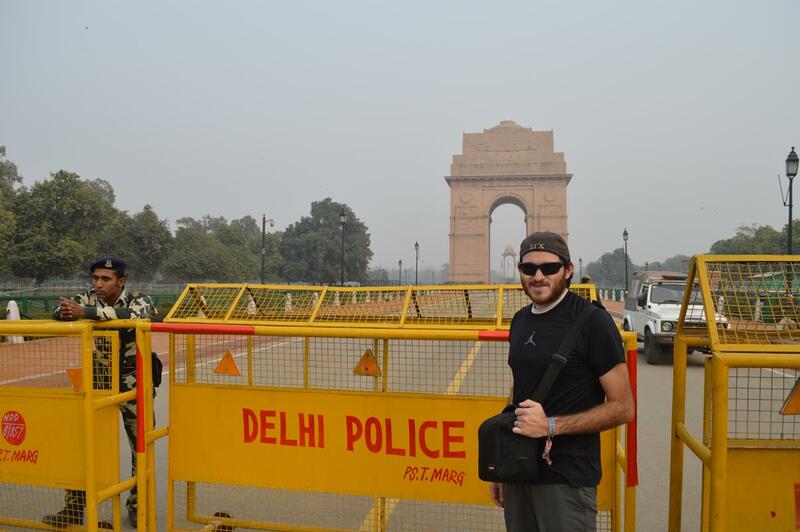 We didn’t really know why, but there were several areas blocked off from tourists in Red Fort and India Gate. The military and police stood by with their casually slung AK-47s and sand bag bunkers as if there was a constant threat to the structures. We took a train from Lucknow to Agra for only 290RS ($3)! Granted, it was crowded with 3 people per small bench and we were the only white people there. It also was very cold and uncomfortable, but it was a great way to immerse ourselves in the culture and live like a local. The food was also insanely cheap, a meal only cost about 150RS each at a restaurant (we never dared to try street food so I don’t know how cheap it was). It’s going to happen anywhere you go and however you dress, the locals are going to stare at you non-stop. This is a staring I’ve never had to deal with before, and I extremely hated it to the point of not wanting to go out to feel the hundreds of eyes burning into me. It wasn’t just me they would stare at either, they’d stare at Pablo just as much and we figured it’s because of our skin color. 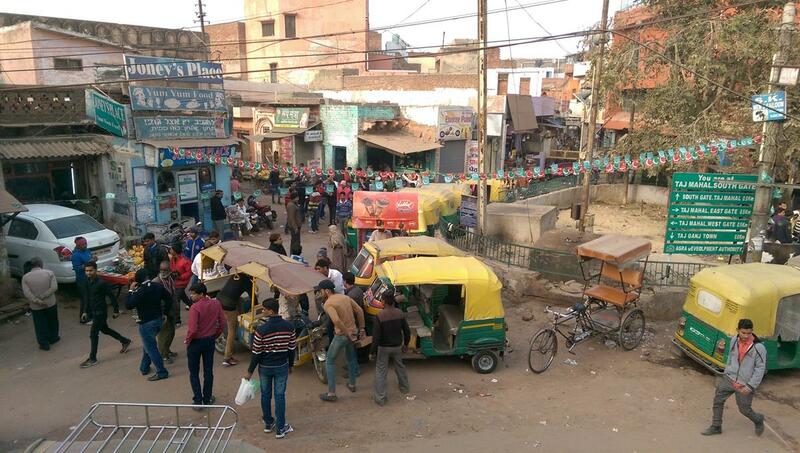 We hardly saw any white people outside of Agra and we must have been so odd looking to them. At first we tried staring back at people trying to make them look away, but they’d just continue staring like they were brain dead. It was very unsettling. I would resort to looking at the ground (something I had to do anyways to monitor what I was walking on) in order to ignore the eyes. I finally resorted to not caring about the staring, but thought I’d turn it into a challenge… I’d make faces at them and see if I could make them smile, laugh or look away. I did get a lot of people waving and possibly smiling at my attempts and Pablo said I encouraged them to stare at white people more because now they’ll expect entertainment. We actually had a lot of people ask for photos with us which was uncomfortable as well, but we tried to make light of it and sometimes asked for photos with them too. They seemed pretty excited about it all… now I understand what it’s like to live a life of a celebrity surrounded by paparazzi… minus the being rich part. It’s completely energy draining to be out in the streets with how many people, vehicles and animals there are rushing everywhere. It’s enough activity to occupy the common people watcher for a lifetime. Every street we went down had a random cow eating garbage or crossing the street. For a country that has the highest population there were just people swarming everywhere, forget having a space bubble! Obviously we didn’t expect the best from a budget hotel, but man oh man those were some sketchy accommodations! The stains all over the bed and sheets encouraged us to sleep in clothes covering us from head to toe and we constantly had to ask the hotel manager to turn on our water in the bathroom. We saw people cleaning blankets in the toxic river and from then on I could only picture our bed sheets going through that process before we slept on them. Pablo and I have never been to a hotel that was so dirty and even our $3 hostel in Agra was cleaner. On the positive note… It came with free breakfast and that was pretty delicious! We spent 1 day in Lucknow (there’s nothing to see in Lucknow, we just had a cheap flight there) 5 days in Agra, and 11 in New Delhi. 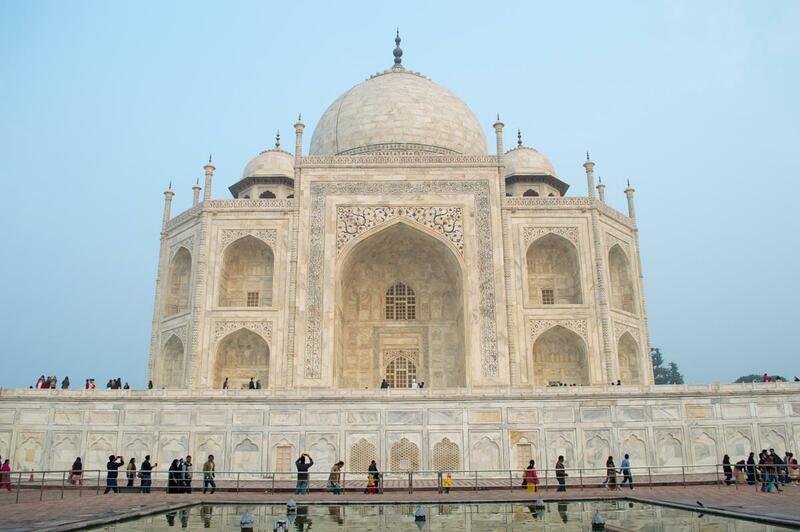 Besides Agra we didn’t even go to the best places to visit for tourists, solely because it would’ve meant a lot more bus and train travel and we just didn’t want to go through all of that. Staying in a place for too long can affect our opinion of a location, and it definitely did in this case. If we’d stayed for only a couple days in Agra and New Delhi, and then moved on to places like Japur and Varanasi we probably would have come away feeling better about our experience. Do you want to find out if you love or hate traveling in India?